This is what was announced in a very general manner by the Minister, to which it would normally be construed as tariff hike by TNB alone. But I have reason to believe that Sabah Electricity Sdn Bhd (SESB) will also be affected the same way. Don't ask me why and how I came to such conjecture, but let's just speculate that if it happen, it will most likely be by similar quantum to the one in July 2011, which is 15%. Do you feel your business is hurt already? But...if you think about the bigger picture, electricity tariff revision is actually inevitable as we move forward towards industry competitiveness, and that can be achieved by reducing subsidies, but let's do it in gradual manner and not making this a yearly affair. 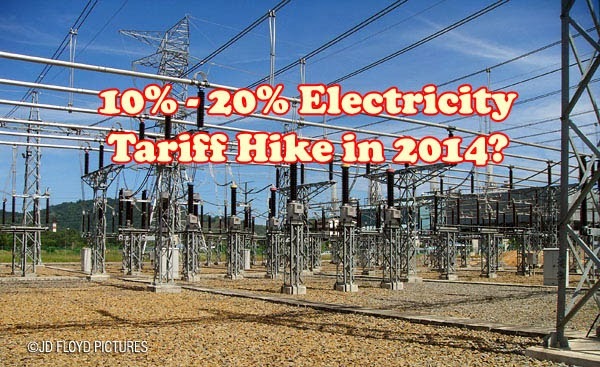 Consumers should brace themselves for a 10%-20% hike in electricity tariffs next year. “The quantum (of increase) is not finalised … but anything below 20% is reasonable,” said Energy, Green Technology and Water Minister Datuk Seri Dr Maximus Ongkili. The final decision on the increase has yet to be made by the Cabinet, but the hike could happen anytime in 2014, he told reporters on the sidelines of a Parliament session yesterday. The move, he said, would be in line with the Government’s plan to gradually cut subsidies. It would also be in line with its efforts to boost efficiency and competitiveness in the Malaysian power industry, as well as to ensure sufficient returns to capital for utility company Tenaga Nasional Bhd to cover its costs. A tariff hike will see rates for both industrial and households increase, but any hike for businesses will be mitigated against the need for them to remain competitive. A home appliance that is rated at 1,000 watts, if left switched on for one hour, would use 1 kilowatt-hour (kWh) of electricity. A 10%-20% hike would translate into an increase of 3.35 sen/6.7 sen per kWh to 36.85 sen/40.2 sen per kWh. This is based on the prevailing tariff rate of 33.5 sen per kWh, which is about 8.5 sen below the “true cost” of power at 42 sen per kWh. In comparison, electricity tariffs in the Philippines and Thailand are 58 sen per kWh and 48 sen per kWh respectively. Ongkili said the Government would implement a “stabilisation” programme to protect consumers, especially the low-income group, when the tariff hike takes effect. Details of the programme have yet to be finalised. The electricity tariff was last revised in June 2011 after the Government raised the subsidised gas price for the power sector to RM13.70 per million metric British thermal unit (mmbtu) from RM10.70 per mmbtu. Gas accounts for about 50% of electricity generation in peninsular Malaysia. Coal accounts for 40%, hydropower about 8% and renewable sources around 2%. Subsidies for the power sector are RM8bil to RM12bil per year, depending on the prevailing price of gas. The Government’s share is RM150mil and the rest is borne by Malaysian oil and gas company Petroliam Nasional Bhd. TheGreenMechanics: They say it's done in the name of efficiency & competitiveness. Let's see if we can achieve this. There are some many more in the list. One by one, they will come. I guess higher tariff should come along with better quality. Even SESB has reduced its SAIDI but power quality remains a question. I know Penampang area constantly experiences low voltage, sometimes even as low as 150 volts.